Amid "ongoing economic and political uncertainty", yesterday Gartner lowered its growth projections for the global semiconductor market in 2012 and 2013, citing "economic headwinds and an inventory correction." STAMFORD, Conn., December 13, 2012— Worldwide semiconductor revenue is projected to total $311 billion in 2013, a 4.5 percent increase from 2012 revenue, according to Gartner, Inc. Due to economic headwinds and an inventory correction, the fourth quarter projections have been revised down from the previous quarter's forecast of $330 billion. Analysts have also reduced growth predictions for 2012 with semiconductor revenue expected to total $298 billion, down 3 percent from 2011. Gartner's third quarter forecast had put revenue at $309 billion for 2012, which would have meant an increase of 0.6 percent from 2011. "The looming fiscal cliff, ongoing European debt crisis, slower emerging market growth and regional tensions have all played a part in reduced growth projections for semiconductor revenue in both 2012 and 2013," said Peter Middleton, principal analyst at Gartner. "Inventory levels were already high at the start of the second half of 2012, and as PC demand rolled off, supply simply overshot demand." The semiconductor market was further depressed when DRAM prices failed to rebound in 2012. Gartner predicts that the DRAM market will not recover until the second half of 2013, when lower supply growth is expected to pull the market into a period of undersupply. This should prove a turning point for the semiconductor industry; memory is expected to lead the recovery with 15.3 percent growth and total semiconductor revenue is projected to reach $342 billion in 2014, an increase of 9.9 percent from 2013. The "Apple effect" is expected to remain pronounced in 2013, helping drive strong NAND and application-specific integrated circuit (ASIC) revenue growth of 17.2 percent and 9.4 percent, respectively. Gartner counts the A4, A5 and A6 application processors from Apple as ASICs, because these are custom processors, designed and solely used by Apple. ASICs will also benefit from the new generation of video game consoles being introduced in late 2012 and 2013. PC production will decline 2.5 percent in 2012. In 2013, total PC production is expected to remain weak; however, ultramobile PCs will grow strongly off a small base. The challenging economic environment has contributed to PC life cycle extension, in addition to users extending the life of their PCs as they adopt tablets. Mobile phone production growth in 2012 and 2013 is predicted to soften overall as the tough economy reduces short-term demand for phones. However, the forecast for utility/basic smartphones has been increased, largely at the expense of traditional phones. In particular, adoption of Android-based entry-level smartphones in emerging regions continues to accelerate and will be a key growth driver. Worldwide smartphone unit production growth in 2013 is forecast to be 33 percent. Media tablet production is also forecast to grow in 2013, rising 38.5 percent to 207.1 million units, up from the third quarter forecast of 169.8 million units. The success of the Amazon Kindle Fire, Google Nexus 7 and Apple iPad Mini illustrate the large opportunity for smaller tablets at the right price, while the white-box tablet market is stronger than anticipated, boosting the overall forecast. 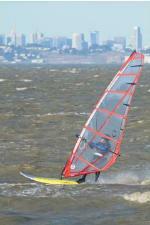 I took these pictures today during the super high "King Tide" at the Palo Alto Baylands preserve on the San Francisco Bay. Best viewed with browser in full screen mode. What is the Fiscal Cliff and how does it impact you? I got this great summary in an email from Terry Savage that I want to pass on to my readers. It’s down to the wire, and they don’t seem to be taking it seriously in Washington. At least not seriously enough to come up with some middle ground that will change the trend of huge deficits and increasing government spending. Of course we all know the real solution: Economic Growth. A growing economy would reduce the need for government spending on unemployment benefits and to help the needy. And it would automatically increase tax receipts, because more people would be working and paying taxes into the government. Instead, what they’re debating is a huge philosophical and political difference over the role of government in America. On the one side, you have those who firmly believe that the economy would grow if only government would get out of the way. And on the other side, you have those who equally firmly believe that the only way the economy can grow is if government intervenes to help. It’s no wonder that there can be no agreement, no compromise, no solution. So here’s a closer look at what would really happen if, like Thelma and Louise, they lock hands and jump over the edge. The Debt Ceiling This is one of the two most critical issues we face immediately. We will bump up against the official $16.394 Trillion debt ceiling by the end of this week! If the government can’t borrow, it can’t pay its bills or salaries or refinance the Treasury bills, notes and bonds as they come due. But Treasury Secretary Geithner has announced they can “borrow from other trust funds” to keep government going into mid-February. Of course, if a corporate executive did this kind of financing, he would go to jail! Unemployment Benefits Lack of a deal will have a serious and immediate impact on the 2.1 million people currently receiving extended jobless benefits. (States pay the first six months, and the government has continued those benefits for at least 99 weeks of unemployment.) If no deal is reached, checks will stop on December 29th. And an additional 1 million unemployed will lose their benefit checks over the subsequent three months. Your Paycheck If you’re working, you will immediately see less money in your paycheck in the New Year, for two reasons. First, the so-called “Bush Tax Cuts” on which your tax rate and withholding are based, will go back to pre-2003 levels. That higher tax will start to come out of your paycheck immediately. Perhaps even more devastating to your paycheck amount, the “payroll tax holiday” (the Obama cut in Social Security taxes or FICA) will end, resulting in an additional 2 percent taken out of your gross pay. Bottom line: You will have less money to spend. The government will spend it for you. Your Tax Refund The refund you expect may turn into a bill for more taxes. That’s because the “Alternative Minimum Tax>> which makes sure that “rich” people don’t get too many deductions, will have to be calculated for your 2012 income. An estimated 28 million more taxpayers will face this new, higher tax bill. Your Doctor Starting in January, Medicare reimbursements to physicians will be cut by 27 percent, or $11 billion, unless an agreement is reached to extend the current payment levels. Many physicians may decide not to accept new Medicare patients. State Poverty Programs The federal government annually sends hundreds of millions of dollars to state and local governments . That spending would be cut immediately if no deal is reached – impacting programs ranging from school lunches to nursing home subsidies. Government Jobs Without a deal , expect notices of job cuts and pay cuts – ranging from civilian to military, giving the media graphic ways to illustrate the plight of government workers and the impact on national defense. These are just the most immediate and visible ways the “fiscal cliff” will impact you, your family, and our country. They are planning a dangerous game of “Chicken” in Washington, D. C. There’s some sense that both sides will be willing to actually go over the cliff – head off for vacation, and then let a new Congress deal with the mess in January. That would leave everything from payroll tax schedules to business expansion plans in limbo, likely causing a dramatic and immediate slowdown in the economy. A recession. The real question is whether going over the cliff would actually be better than any deal the two sides might agree upon. We’ve spent an “extra” trillion dollars every year, above what the government has collected in taxes, to get the economy going. And we have a very lame recovery. Will more government spending fix that problem? Will an agreement to tax the wealthy raise enough money to solve our deficit problem – or will it destroy incentives and slow the economy? If we don’t learn from history, we will certainly be forced to learn our answers the hard way – by living through this reality check. And that’s The Savage Truth. 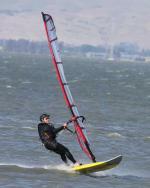 Now and then I like to watch Jim Cramer's "Mad Money" show on CNBC to see what direction the wind is blowing. That is, I think Cramer has a very entertaining show, especially if you like shouting and nobody taking the other side of his arguments, but it seems he echos what is "group think" that tells you "why" a stock is up or down, but does very little for making good, long-term decisions. Sponsors who sell trading strategies love his show as it is easy to sell stocks and advice for stocks that are moving. Intel (INTC): "During the period when it was doubling and doubling again, I was behind it, but I have walked away from it. 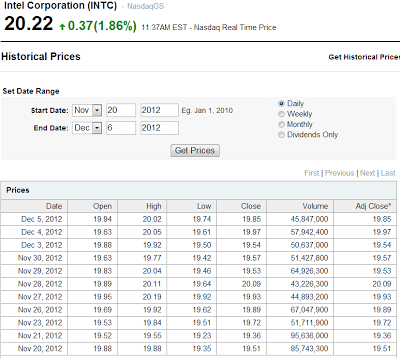 INTC has a good yield, but it has no product used by mobile to speak of, except their own, and that isn't doing so well. INTC is stuck in the world of the PC, so even though it has a good yield, I say 'don't buy." Two weeks later, on November 11, 2012, I bought shares for my personal account at $20.06. 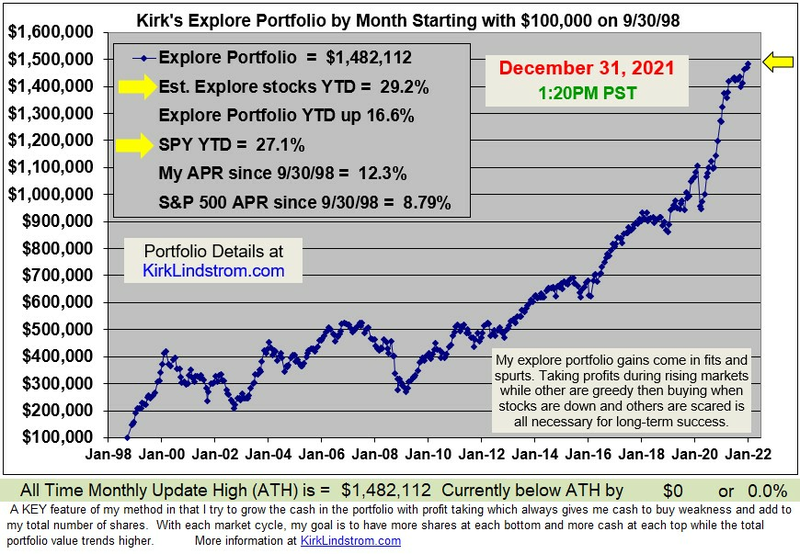 I also increased the "Auto buy at $19.75" price target in my newsletter for my "Explore Portfolio" to anything under $20.25 to take advantage of any price weakness. Intel: "I’m not going to tell someone to sell this stock with a 4.6% yield. I am going to say wait until it goes to 4% for a bounce, because I do believe the yield will support it, but I don’t see any reason why you should own it. Sell it only after a bounce when the yield drops to 4%." 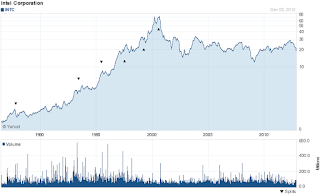 I bought my first shares if Intel in April 1993. At a split-adjusted price nearly 10 times what I paid for those shares, I believe Intel is a safer, more compelling buy now than it was in 1993. 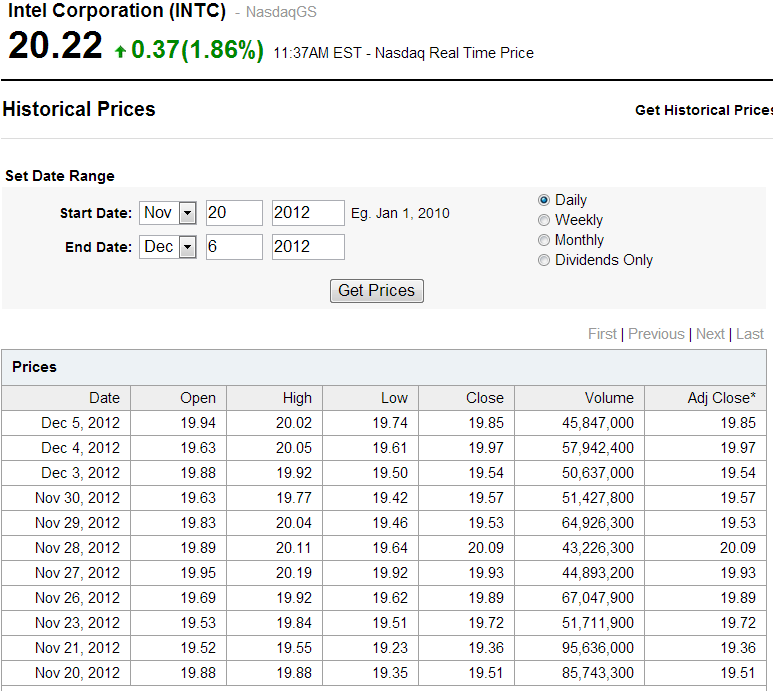 Yesterday, Dec. 4, 2012, Intel announced the largest bond sale in its history to buy back stock. This offering was 20% larger than its $5 billion similar offering in September 2011. Wise investors will take advantage of low prices now to buy before tax loss selling ends and Intel uses these funds to repurchase shares. I think Intel did something far better than buying ARM. Intel invested billions in new semiconductor equipment to build products with better performance than anyone can get from ARM chips running on competing processes. Intel is a great buy here, especially under $20. Intel's valuation numbers will improve as they buy back shares with the funds from its just announced $6 billion bond offering. I took profits at $27.25 in February of this year with my newsletter explore portfolio, but now I am buying back. I would not be surprised to be taking profits in some of the Intel stock I've bought recently right around the time when TV gurus jump on the Intel bandwagon again next year. Jump on now and get a good seat! Yesterday Intel closed at $19.85 and now it is over $20. Was yesterday the last chance to buy Intel under $20? I didn't mention in in my Seeking Alpha article, but I think Intel will probably build chips for Apple (AAPL) in the near future. By the time that is public knowledge (ie Intel chips showing up in tear-downs of Apple products) the stock will probably be $30 and then Cramer will change his tune. Yesterday that was a comprehensive article in India's Economic Times about GeoGlobal Resources (GGR) problems in India with GSPC, the Gujarat State Petroleum Corp, and Jean Paul Roy, GGR's former CEO. The way things are in India, I've reposted most of the article below in the event it "vanishes." AHMEDABAD: Jean Paul Roy, a Canadian geologist who lives in Guatemala and drives around in a Scorpio, has been a bee in Narendra Modi's bonnet long before Arvind Kejriwal discovered him and alleged the scientist made billions overnight thanks to sweetheart oil and gas deals with the Gujarat government. Actually, Roy has been embroiled in several disputes with state authorities, particularly after he publicly questioned Modi's dramatic announcement in 2005 that Gujarat State Petroleum Corp's (GSPC) field in the KG Basin held an astonishing 20 trillion cubic feet (tcf) of gas. Roy, a 10% partner in the block and a seasoned geologist who has explored hydrocarbons in 30 countries, quickly responded saying Modi's claim was premature. Relations between the two partners have been troubled since then, and GSPC wrote to the oil ministry two years ago saying it wants to terminate the partnership with GeoGlobal. Roy's company has questioned some costly drilling by the state firm, which has spent $2.5 billion but is five years behind schedule in developing the field. "Roy impressed GSPC, and the company decided to partner with his consulting venture that was to be listed later in America. Like CairnBSE 0.17 %, Roy also had ambitions to list his venture in India. But everything changed in 2005," says a senior GSPC official who did not want to be named. Roy, who speaks French, Spanish and English, is regarded by friends as a man with an eagle eye for discovering oil as well as people who matter. Former ONGCBSE 0.28 % chief Subir Raha was on GeoGlobal's board till his death two years ago. Earlier, the company had appointed Avinash Chandra, former director-general of hydrocarbons, a director. Roy's innings in India began as a technical advisor to Canadian company Niko Resources, which was exploring the Hazira offshore field in partnership with GSPC. He also advised, say his associates, Niko during the discovery of the D6 Block, now controlled by Reliance IndustriesBSE 1.29 % and BP. But his luck seems to have suddenly run out. He has diluted his majority stake in GeoGlobal Resources, although he still holds 5% interest in the KG Basin block. It is no wonder the stock hit 5¢ today before rebounding 60% as I type!! 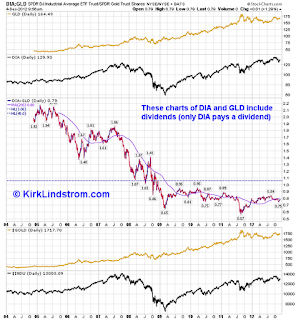 Yesterday I published an article at Seeking Alpha titled "Dow/Gold Ratio Remains Low On Historical Basis." 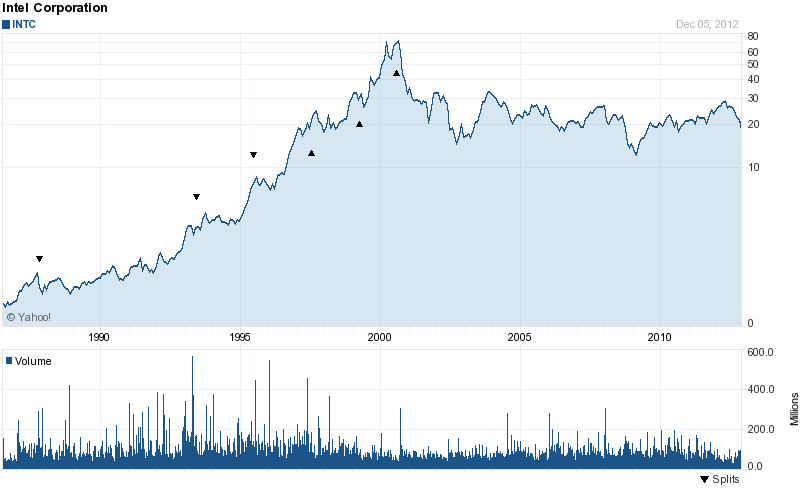 One reader suggested I include dividends in the DOW chart. 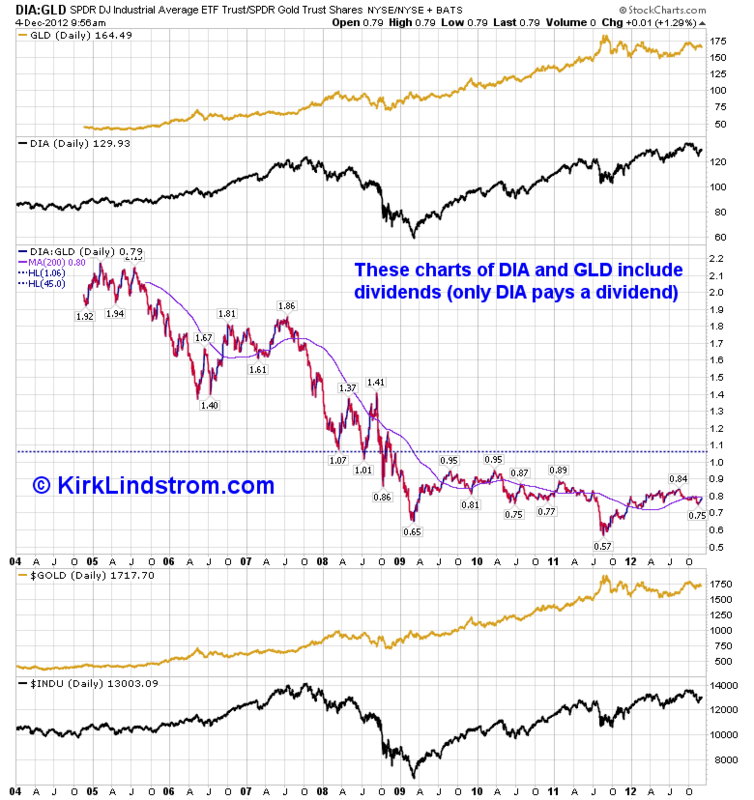 This chart shows the ETFs for the DOW (DIA) and Gold (GLD) with dividends included. 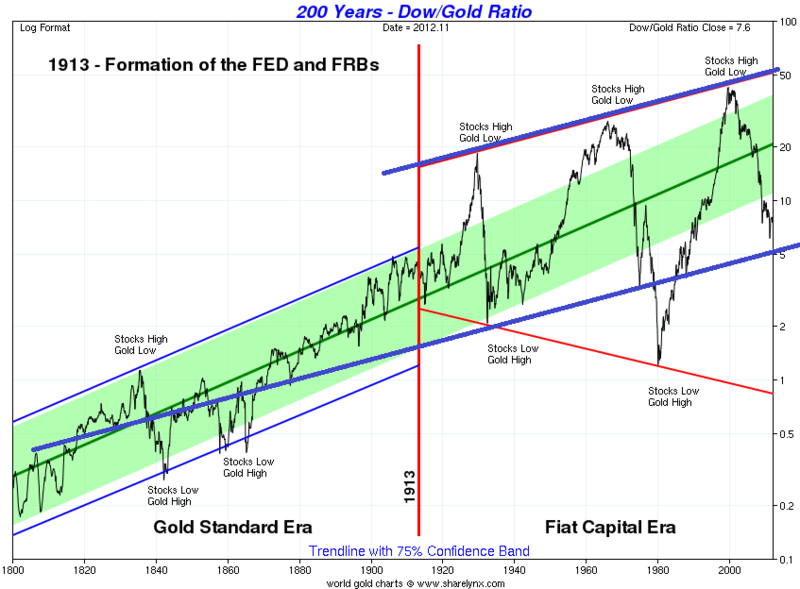 Another reader thought the long term chart in my article titled "200 Years - Dow/Gold Ratio" could be improved on so he gave a link to a temporary chart in the comments section. His chart added blue resistance and support lines for the period prior to the Federal Reserve Act of 1913 created the Fed and red resistance and support lines for after the Fed was created.